Dean’s Court was a ‘yard’ of essentially slum housing off the north side of Middle Street roughly where Primark is today. It was reached via a door-sized alleyway between a shop and a lowly beerhouse that were directly opposite the George Hotel. The occupants of Dean’s Court were generally the very poor who could not afford to live elsewhere and in the 1851 census the occupants of Dean’s Court were recorded as Sarah Gregory, a 46-year old widowed charwoman with her three children and a lodger; 32-year old mason Joseph Miller with his wife and five children; Thomas Patten a 34 year old plumber and glazier but recorded as a pauper, with his wife and three children; pauper Leah Abbott and her three children and 34-year old shoe maker Thomas Norman with his wife and six children. In December 1851 (after a cholera epidemic in 1848-49) the Board of Health held a public enquiry, headed by Dr Thomas Rammell, the Board of Health’s inspector, into the public health and sanitary conditions of Yeovil town. Dr Tomkins, in giving evidence at the enquiry, cited Dean’s Court as an example of poor hygiene where eight houses shared one privy that was so close to the court’s well that it became contaminated. 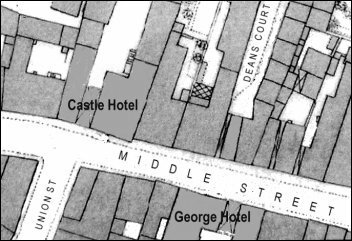 In 1896 as part of a ‘town improvement’ the Town Council closed Dean’s Court. 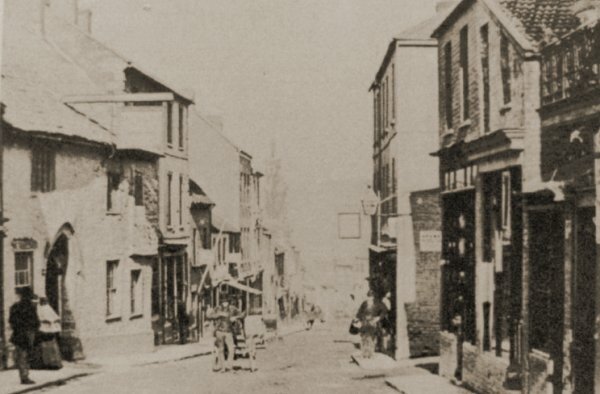 This sepia-toned photograph looking east along Middle Street dates to about 1875 and is probably one of the earliest photographs of the Castle Inn, seen at left. The house and herbal shop of murderer Robert Slade Colmer was the three-storey building next to it - the building where the murder of Mary Budge took place!! The entrance to Dean's Court was the other side of the two-storey building next to it (to the immediate left of the man with the stovepipe hat resting against his hand-cart). 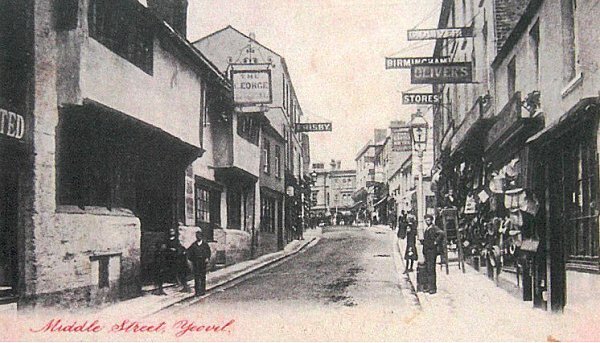 This postcard dates to 1904 and looks along Middle Street towards the Borough, with the George Hotel at left. Although Dean's Court had been recently demolished by this time, the entrance to it was probably the middle of the three doors at right of the photo.